This is a real statement piece. It is so striking and vicious yet the rose cut gemstone adds a feminine and delicate edge to the piece. It features a beautiful Rose Cut Gemstone (either Rainbow Moonstone, Labradorite, Grey Moonstone or black Onyx) and a Crescent moon made of two sterling silver cast Raven talons. It is very sturdy and comes on a wide ring shank. The ring and claws are made entirely of sterling silver, Which has been Oxidised to a gorgeous oil slick grey. The ring Measures 1 and 3/4 inches wide (or 4.4cms wide) and 1 and 3/8 inches tall (Or 3.2cm tall). Please note this is made to order so will take between 1-3 weeks for me to make and send. It is sent via international air mail (untracked) and can take 3-15 working days to get to you. If your are from nz I will send it via tracked courier and takes 1-3 working days. This ring is absolutely magnificent. It's dazzlingly beautiful and extremely comfortable. Charlotte is an absolute joy to work with! I wouldn't hesitate to shop here again! I could not be happier with the customer service or the pieces. Everything is beautifully designed and beautifully constructed. Absolutely stunning piece of jewellery. 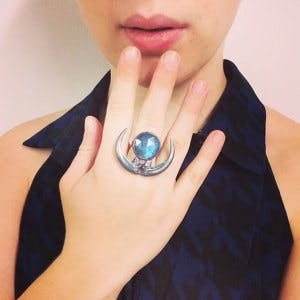 The ring is gorgeous, made in solid and heavy silver, the moonstone is stunning, with heavy blue colour. Charlotte was so kind to custom the moonstone as I like more, many thanks Charlotte! Such a memorable and beautiful ring! Such a memorable and beautiful ring! Thank you for letting me chose my own stone! Love it!! !